Discovery Arts is currently seeking “Celebrity Ambassadors” from all art mediums to get involved in various levels, please consider sharing your craft with children needing your encouragement while they are in the hospital. Use your artistic talent as a musician, an actor or artist to help us spread the word about the need to help children in the hospital cope with their illness and the treatments they must endure. As an example, Cathy Rigby participates during her performances of Peter Pan, offering raffle tickets to the children in each nights audience. One lucky child wins a walk on part with the cast and has the chance to "fly" after the show with Cathy. McCoy-Rigby Entertainment has generously donated proceeds to Discovery Arts during the Production of Peter Pan and has taken Discovery Arts with them on tour! As a Performer and Talented artist, here are some ideas about how you can get involved right in your own community during your performances. We'd also love to hear about your creative ideas and how you see your involvement as a Discovery Arts Celebrity Ambassador. 1) Dedicate a song during your Live Performances. Mention Discovery Arts and how music and the arts help children cope with cancer treatment and life threatening illness. 2) Mention on stage that you'll be "Passing The Hat" or collecting at the exits and have your audience donate to Discovery Arts. 3) Send us a note along with pictures and/or youtube videos of your dedication and we'll post them on our blog and on all of our social media sites. 4) Connect with us on Facebook and Twitter and share us with your fans. 5) Post on our Facebook Page wall about your performance dedication. 7) Start a "Meet-up" in your community and perform for a Discovery Arts Fund-raising. The Yard House and California Pizza Kitchen offer 20% donations of all purchases when hosted for Discovery Arts. 8) Contact us when you are performing in Southern California, Branson, Missouri or the Dallas, Texas areas if you'd like to perform for the children in one of the Hospitals we serve. 9) Share a special piece of artwork, a painting or sculpture and donate it for an auction or special event. Donate tickets to shows, sporting events and special show and/or travel packages. We work closely with CharityBuzz.org Auction site to conduct specialty auctions to raise funds, and also with Good Scout which is a social "good" consultancy that helps brands make smart, impactful and sustainable leaps in how they do a greater good. Don Harper composes music for film, television and the stage. Don composed the score for Disney’s Lion King 1.5 DVD release and for the animated television series, The Legend of Tarzan. Don’s work can also be heard in feature films such as G-Force, National Treasure & National Treasure 2, The Guardian, Texas Rangers, Armageddon and The Rock; in the TV film Houdini; and in the series The Magnificent Seven. An accomplished orchestrator and conductor, Don has contributed to such films as Jack Frost, Twister, Speed and Disney’s animated feature, Tarzan. Don also arranges, composes and produces music for live venues worldwide, including Sight & Sound Theatre’s musical production; Joseph, Tokyo DisneySea’s, Nighttime Halloween Parade and Disneyland’s fireworks spectacular Believe – There’s Magic in the Stars. Cathy Rigby, Olympic Gymnast, Actress and Star of "Peter Pan"
We are honored to have the exceptional talents of Cathy Rigby as our voice for the children of Discovery Arts. Cathy Rigby has achieved her dreams and is still soaring to new heights everyday. America first took notice of Cathy at the Olympics in 1968. Her spunkiness and drive to succeed charmed any audience that watched her. She quickly became known as "America’s Sweetheart of Gymnastics." The role that Cathy is best known for is that of Peter in the musical, "Peter Pan." She earned a Tony nomination for her performance of Peter Pan on Broadway and "Peter Pan" earned more Tony nominations after the production toured nationally. Cathy Rigby is working hard to raise awareness for our mission, which is an ongoing problem with ongoing needs. After years of gymnastics, Cathy sought out to conquer the world of acting. Her determination and competitive spirit inspired her to go through years of training to perfect herself before she went on stage. She took seven years of voice and acting training and twelve years of ballet to prepare for stage and TV roles. Her musical debut was Dorothy in the "Wizard of Oz." Audiences adored her and she continued to move on to other theatrical plays and musicals including "Annie Get Your Gun," "Meet Me in St. Louis," "South Pacific," "Paint Your Wagon," "They’re Playing Our Song," "The Unsinkable Molly Brown," "Seussical the Musical," and "Peter Pan." She also performed on Broadway with "Seussical the Musical" and "Peter Pan." Cathy obtained acting roles in various TV movies including "The Perfect Body," "Hard to Read," "The Great Wallendas," and "Triathlon." Her acting career has also helped her to pursue another career with her husband, actor-singer-producer, Tom McCoy. They formed their own production company called McCoy Rigby Entertainment. Through their company, they have successfully produced many seasons of musicals, plays, concerts, and special events at the La Mirada Theatre for the Performing Arts in La Mirada, California. They have also launched many national touring productions including "Jesus Christ Superstar," and "Peter Pan." Combining the talents of musical theatre star Cathy Rigby with Tom McCoy's extensive production and theatrical experience, McCoy Rigby Entertainment has become one of the nation's premier theatrical production companies. Credits include Tony-nominated Broadway shows, long-running national tours, multiple-award-winning Los Angeles stage productions, and hit TV specials. Creative home-base for McCoy Rigby is the beautiful La Mirada Theatre for the Performing Arts, one of Southern California's top legitimate theaters, where the company embarks on its twelfth season of producing award-winning plays, musicals, concerts and special events. Hoku is a musician and songwriter. She is the daughter of Hawaiian singing legend Don Ho. After being raised in Hawaii, Hoku moved to California to continue her education. It was there, in the latter part of 1999, that she signed a contract with Interscope on the Geffen Records label. Hoku's debut single "Another Dumb Blonde", which was certified Gold, appeared as the Title Song in the movie Snow Day. It became a Top Ten Video on MTV -- and her first single hit gold. In 2000, she released her self-titled, debut album. In 2001 she recorded the song "Perfect Day", which was used as the theme song to the feature film Legally Blonde. This song was later featured in both JCPenney and Sandals Resorts commercials. Shortly after the release of her self titled album, one of her tunes, "Another Dumb Blonde," hit the Billboard charts. Some of her other songs are "You First Believed," "Just Enough," "What You Need," and "Oxygen." Hoku appeared on a Nickelodeon special with many other stars, such as Britney Spears, 'N Sync, Sean Combs, and Aaron Carter. She also performed as a top billing performer in all of the Radio Disney Live! 2001 World Tour concerts across the United States, performed in the World Music Awards in Monaco, did a live television concert special entitled "98 degrees and Hoku in Concert" and most recently opened for Gwen Stefani in Concert in Hawaii. Her latest music and her current release "Listen Up" can be found on i-tunes and is produced by her own label Ola Vista Records. Founding member and bass player of seminal blues-rock band ‘Free’ . 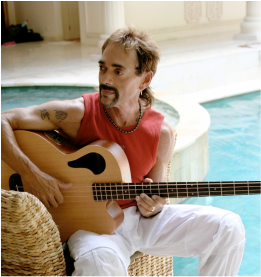 Andy Fraser has also helmed several post Free bands - notably Sharks and the Andy Fraser Band - and has released several solo works, including the albums, Fine, Fine Line and Naked…and Finally Free. Fraser wrote and co-produced Free's mega-hit, “All Right Now”, BMI “Million-Air” award for passing 3 million radio/television plays in the U.S., British Music Industry Multi-Million Award for exceeding 2 million-plus radio plays in the UK. Wrote and co-produced many of Free’s biggest hits: “Fire and Water,” “The Stealer” and “I’m A Mover.” Writer of the International hit, “Every Kinda People” by Robert Palmer.